Ha ha; got home at 8PM and well. I had distractions that’ll probably be posted at my blog later. XD And I promised my bro I’d hang with him, so probably a finished product late late tonight. Ah Wiglaf; he’s going stir crazy with nothing to do, ne? And the Pair-a-Thon continues strong with three entries! Driver just loves to be snarky. 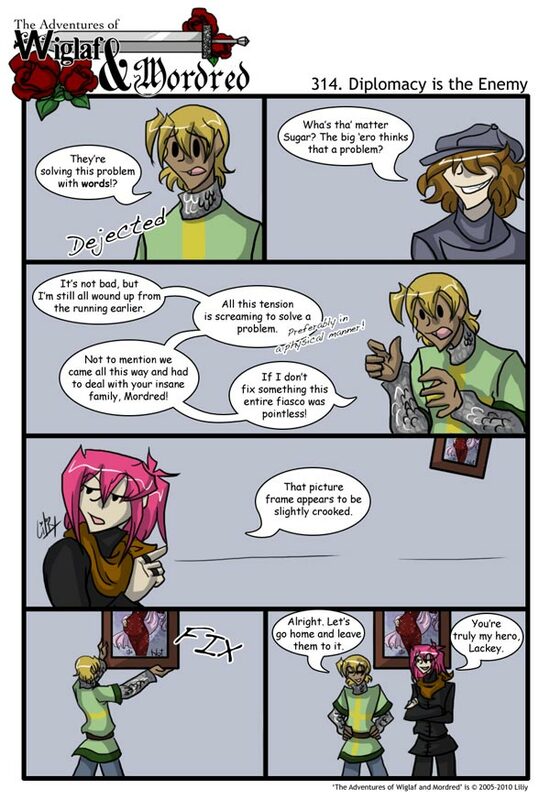 XD And Wiglaf; he totally fixed that fixed that picture frame. To the max. Liliy, I also adore you, but at this very moment I am adoring Wiglaf more. *Double-takes. * Wait. Did Mordred actually say something that could be construed as pseudo-nice? Wait-wait! Did Mordred actually empathize with Wiglaf’s frustrated hero-impulses and act in a helpful manner? …possibly to speed their escape, but still? DID HE? Even if Wiglaf and Mordred are polar opposites, they still are so alike it’s hilarious… I don’t think I’ve ever seen two people that are so alike and so different at the same time. It’s real amusing that Mordred finally found a reason to salute Wiglaf’s heroism. XD And Driver looks really cute with that wide grin. Haha, Wiglaf cracks me up. xD He’s so OCD. I just realized the picture in the back ground is actually one of the pin up pages. Same here, and I’ve read this at lest 3 or 4 times now. Prity crafty to have snuck in that picture,Liliy.